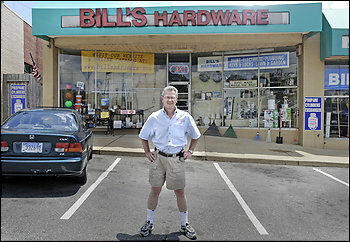 When Wal-Mart Moves In, Neighborhood Businesses Suffer. Right? 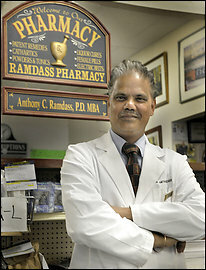 Anthony Ramdass used to worry about Wal-Mart. For more than a decade, he has watched from behind the counter of his pharmacy in a converted pool hall as businesses slowly blossomed along Annapolis Road in Prince George's County. Then the biggest retailer in the world arrived, offering $4 prescriptions and always low prices. Ramdass braced himself for legions of defections. But the pharmacist said not much has changed in the year since the behemoth from Bentonville, Ark., threw open its doors. His loyal clients have not strayed. They like the fact that he delivers for free and remembers most of his customers' names. Wal-Mart opened its store in Landover Hills -- the first inside the Beltway -- in a storm of controversy last year bred in part by its reputation for running small businesses like Ramdass's out of the rural towns and suburbs that for decades were the retailer's breeding ground. There was concern that the so-called Wal-Mart effect would be replicated, if not magnified, once it moved into more urban areas, such as Landover Hills. No comprehensive study has been done on Wal-Mart's impact on this stretch of Annapolis Road, the heart of this redeveloping neighborhood. But local proprietors and community leaders say the fears have not panned out. 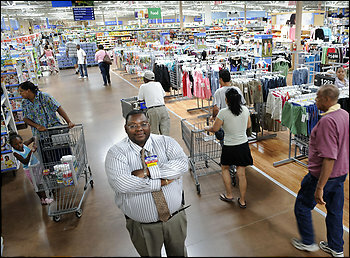 Some say the dour economy is a bigger threat than Wal-Mart. Other store owners credit Wal-Mart for boosting their sales, through both its proximity and community outreach programs. "Wal-Mart was just the big gorilla coming into the community," Ramdass said on a recent afternoon, standing behind the counter of his store. "I think it's perception more than reality." Ongoing research at Loyola University Chicago suggests one reason why the small businesses have been preserved. In examining Chicago's blighted West Side neighborhood in the year after Wal-Mart entered, researchers found some correlation between how far a business is from Wal-Mart and its likelihood of surviving. That relationship seems to be weaker in urban Chicago than in smaller towns, said Julie L. Davis, the university's community research coordinator and who is leading the study. Davis said more study is needed and expects to complete the research over the next year. "There's so many other things happening in an urban environment," she said. "It'd be so tough to nail down what's up with Wal-Mart." The retailer designated Chicago and Landover Hills as two of 10 "jobs and opportunity zones" designed to spur economic development around its urban stores and help small businesses. When it launched the program two years ago, Wal-Mart said it would offer free advertising to local stores and seminars on how to do business -- and even compete -- with Wal-Mart. It also promised grants to local chambers of commerce. The program is designed to last two years in each community. The company has carried out parts of the program in each zone. It is working with businesses in all locations on advertising but has yet to hold a seminar in Landover Hills. Wal-Mart spokeswoman Rhoda Washington said she hopes to hold one soon. Adam Arroyos, who oversees the program nationally for Wal-Mart, said the most well-attended workshop was held in Decatur, Ga. It has since evolved into business networking sessions and expanded to Miami, Tampa and Raleigh, N.C., he said. "There's not a one-size-fits-all," Arroyos said. "We leave the design in which that's going to happen to the community." In Prince George's, Wal-Mart has donated several thousand dollars to help four independent businesses near the store advertise in local newspapers. It also produced radio spots to air over the store's sound system. 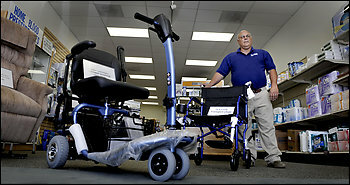 Wal-Mart selected the stores with help from local officials.